Charcoal is naturally a loose drawing medium. However, this doesn't mean that it cannot be used with precision. We just need to recognize its unique qualities and use them to our advantage. Charcoal produces a rich range of value with strong darks. It can be applied and manipulated quickly allowing the artist to capture visual information with speed. 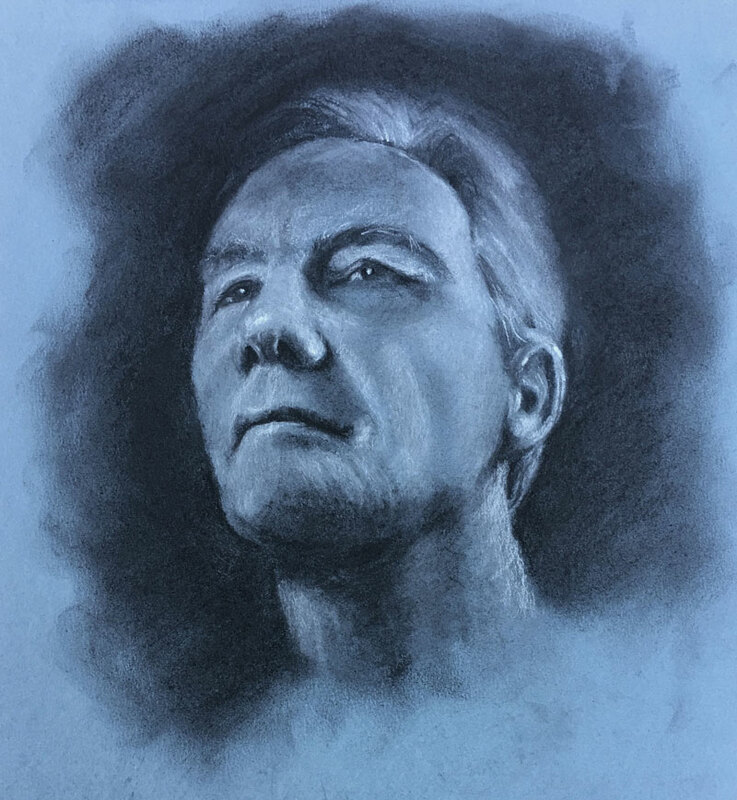 When it comes to portrait drawing, charcoal is an exceptional medium for modeling and developing the details of the features. Charcoal for drawing is produced in several different forms and each has its own characteristics. Understanding the type of charcoal that you are using is essential for finding success with this medium. Vine Charcoal - Vine charcoal is uncompressed and is usually produced as round sticks. The material is powdery, easily smudged with a finger or blending stump, and easily erased. Vine charcoal can be used for blocking in initial values, contours, and guidelines. The marks are easily altered with a kneaded eraser, blending stump, or by using a finger. Compressed Charcoal - As the name implies, compressed charcoal is charcoal that has been compressed into a stick. Because the material is compressed, the resulting marks are much darker that those produced by vine charcoal. It is more difficult to erase compressed charcoal so it is usually reserved for refining details and pushing values darker in the later stages of a drawing. The material found in charcoal pencils is made of compressed charcoal. White Charcoal - White charcoal is a compressed chalk. It is not pure charcoal. Its characteristics are similar to compressed charcoal - it is strong in intensity and more difficult to erase. White charcoal is available as sticks or in pencil form. Blending Stump / Tortillion - A blending stump is made of compressed paper while a blending tortillion is made of tightly rolled paper. Both tools are used for blending and smudging charcoal or other powdery media in areas where precision is required. Kneaded Eraser - A kneaded eraser can be pulled and shaped and is designed to lift the material from the surface. It can be used to lighten values without comprising the texture. When drawing with charcoal, a kneaded eraser can be used as a mark-making tool, producing lighter strokes over locations of middle to dark values. There is an endless number of ways an artist can approach drawing a portrait. We should always consider the medium and its characteristics when deciding on the approach that provides the best chance for success. One approach is to draw the form of the head and plan out each of the facial features with precision. This approach is best suited for mediums that are also precise - graphite, pen and ink, colored pencils, etc. However, the nature of charcoal allows us to draw the portrait with a looser approach. We can loosely block in areas of darker value with vine charcoal, altering the shapes and value relationships as we go. Instead of focusing on the lines and edges in the beginning stages of the drawing, we can focus on the values. Details can be developed as they slowly "emerge" from the development of the values. We may start with a loose indication of the head with a few lines. Finding the angle and length of the brow line is usually a good place to start. From here, we can start developing the value relationships and begin modeling the form of the face. Since the light source is originating from above, most of the darker values exist around the eyes, under the nose, on the upper lip, and under the chin and neck. As these darker values are added, they are gently smudged. Additional applications are added over the smudged locations, slowly developing the details. We can define the edges of the head and other details by developing contrast in the value. Outlines are avoided. Highlights and lighter values are erased out with a kneaded eraser before they are intensified with applications of the white charcoal. Since the light source originates from above, most of the lighter values exist on the forehead, bridge of the nose, cheek bones, and lower lip. Darker values are strengthened with additional applications of the vine charcoal. Now that we have a good idea of the form of the face, we can start developing the details of the portrait. These details are defined and refined using a combination of the compressed charcoal pencil and white charcoal. Although we are focused now on the details, we shouldn't abandon the process of modeling. Subtle changes of value can also be developed further with the charcoal pencils. Transitions are blended using a blending stump, resulting in a more natural skin texture. Dark compressed charcoal is applied to define the edges of the head and blended with a finger. This increases the contrast between the background and the head. If you've never taken this approach to portrait drawing, give it a "go". Charcoal is the perfect medium for approaching portrait drawing in this manner. Start loose and progressively become more refined and precise as you go. You may find that this approach is better suited for you as an artist.